The Ducks were back in action on Tuesday with the team on the field for practice. Of course this team now preps for a key game in Salt Lake City facing a pesky Utah squad. The Utes have struggles of their own trying to replace Tyler Huntley at quarterback. 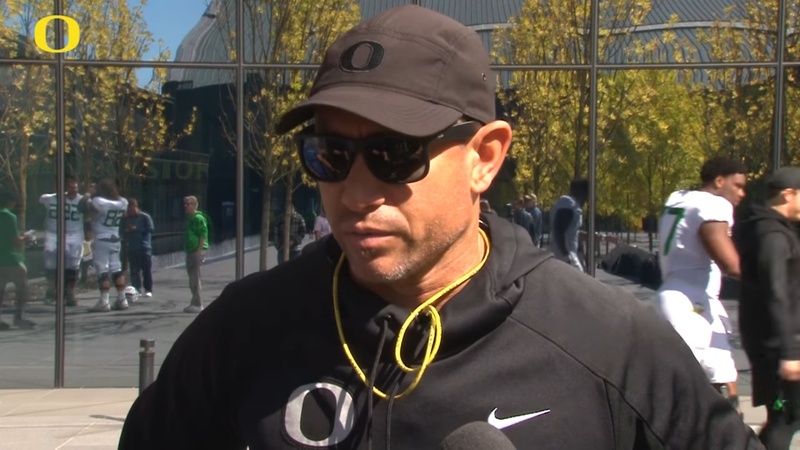 On Tuesday following practice, offensive coordinator Marcus Arroyo spoke with media about practice, the win over UCLA and what's ahead with Utah. We posted the highlights below or you can view the video at the bottom. "I think more than anything it goes back to the bond that a quarterback and a receiver can start to construct over the course of a career or time. But we've really pushed that to all our guys. Of getting together and being together and building that bond. It's just time together. Coach has done a great job of making sure we give time to our guys to learn about each other, be around each other. We gotta continue to push that forward. That's when you start to develop great chemistry among a team." Rather have Mitchell or pass the ball around? "Both. Is there a both A and B? Because the reality of it is I think on any team. Would you like to have a guy that you really count on to make some explosive plays? Or not? The answers yes. And then would you love to spread the ball like we've done here already? I think the answers yes. So I think how do you do all those things? How do you be effective. The answer is both. Spreading the wealth, that's a big part of what we're doing."